LONG BEACH, Calif.--(BUSINESS WIRE)--Pioneer Electronics (USA) Inc. today introduced the Elite® SC-71 and SC-72 home theater AV receivers, offering outstanding audio performance utilizing the power of Class D3 amplification. The 7.2-channel receivers are designed to deliver studio quality audio and video output along with multi-zone and multi-source capability, 4K Ultra HD upscaling, high-resolution audio playback and the convenience of wireless control via Pioneer’s proprietary iControlAV2013 App. Class D3 Amplification – First introduced in a $7,000 Elite AV receiver, Pioneer’s ultra high performance Class D3 amplifier technology is now integrated in both SC-71 and SC-72 models. Class D3 is engineered to operate at extremely high output levels with virtually no distortion and no loss in performance, even when all channels are simultaneously driven at full volume, making the SC line of receivers one of the most efficient and most powerful amplifiers on the market. The amp technology delivers the true audio potential of high-resolution audio content as well as other high-definition uncompressed sources such as Blu-ray Disc™ titles. Multi-Zone Network Capabilities – The SC-71 and SC-72 are built for maximum installation flexibility, offering a variety of multi-zone set-up configurations. All seven speaker outputs can be reconfigured five different ways, including a true 7.2-channel speaker setup or a full 5.1-channel with the extra outputs used for powering a completely different zone altogether, and all controllable from the receiver and/or user’s portable device via the iControlAV2013 App (available for iPhone, iPad and iPod touch and Android™ OS devices). Both models offer simultaneous entertainment from different sources in up to three zones – a main zone, a powered Zone 2 (two speakers in a second room) and a third HDZone (additional HDMI® source to a third room). With the SC-72 (for Zone 2), the model adds the ability to adjust tone (treble and bass), volume and balance (left and right), and the option to incorporate a subwoofer to create a more powerful 2.1-channel system. The SC-72 also offers output for a fourth zone (Zone 3), a two channel audio experience with the ability to control volume and balance. Custom Installation – For advanced home theater control, both receivers are certified for compatibility with the most popular custom control companies, including Crestron® and Control4®, and offer custom installation features including full two-way RS-232C-over-IP control, including the ability to receive metadata from network and iOS connected devices. Simple Control and Set Up – Pioneer’s proprietary iControlAV2013 App, available free of charge on the App Store on iPhone, iPad and iPod touch or at www.AppStore.com, or Google® Play (www.GooglePlay.com) for Android devices, offers wireless control over the features and functionalities of the SC-71 and SC-72 from the convenience of the user’s own smart device. Both models also feature Pioneer’s AVNavigator (now available for Windows® on the bundled CD-ROM, for Mac from the Pioneer website and for iPad on the App Store), a two-way interactive owner’s manual that walks users through the entire setup process of the receiver including speaker arrangement, sound optimization and firmware updates. Expanded Music Options – The SC-71 and SC-72 enable playback of WAV, MP3, WMA, AAC and FLAC files from a networked computer or a connected USB drive. For 2013, Pioneer also added playback of high-resolution AIFF and Apple Lossless files, and Gapless and DSD file music playback. Both receivers are Windows 81 certified and feature DLNA® 1.5 certification for music content playback from a networked DLNA server or DLNA application being used on a Windows PC, Mac, or smartphone connected on a home network, either through a wired Ethernet connection or optional AS-WL300 wireless Wi-Fi® adapter. The receivers offer a wide range of music options including access to today’s most popular Internet radio music services including PANDORA® and vTuner® internet radio. Pioneer’s PUSH PLAYER, a feature on the iControlAV2013 App designed for the new Elite receivers, enables users to access the music libraries stored on their devices and create playlists for wireless streaming. Music Streaming – Users of iOS devices can take advantage of Apple’s AirPlay, which allows users to stream their iTunes music whether from Mac or PC, as well as music stored on their iPhone, iPad or iPod touch2. Both receivers also support Android OS devices, and on compatible HTC® smartphones (including the new HTC One Phone) using HTC Connect3, enable direct music streaming for ultimate convenience. 4K Ultra HD Upscaling – Both SC receivers support the next generation 4K Ultra HD resolution standard to provide the highest quality video image available, with the ability to pass through 4K video signals to any compatible displays. The models also have the ability to upscale lower resolution analog and HDMI video signals for viewing in 4K Ultra HD resolution when used with the latest 4K displays. The new receivers include built in Mobile High Definition (MHL®) connectivity for playback of audio and video content (including high-definition 3D content) and faster phone charging. The higher model SC-72 utilizes an aluminum panel and insulated dual chassis to reduce noise and improve audio quality output. Both Elite SC-71 and SC-72 receivers will be available in June with suggested retail prices of $1,100 and $1,400 respectively. 1To use Windows 8, consumers must first update firmware on the receiver. The firmware update will be available soon on the Pioneer website. 2AirPlay requires iTunes 10.1 or later and iPhone, iPad or iPod touch with iOS 4.2 or later. A home Wi-Fi network is required. 3 HTC Connect is defined as interoperability testing of music streaming performed between compatible smartphones and Home AV products using the HTC Connect Music Application. Third party music applications, meaning apps other than the HTC Connect-compatible smartphone’s native music player, may not work with HTC Connect. PIONEER, ELITE and the PIONEER and ELITE logos are registered trademarks of Pioneer Corporation. HTC, the HTC logo, and HTC Connect are registered trademarks or trademarks of HTC Corporation. DLNA, the DLNA Logo and DLNA CERTIFIED® are trademarks, service marks, or certification marks of the Digital Living Network Alliance. Control4 is a registered trademark of Control4 Corporation. Crestron is a registered trademark of Crestron Electronics, Inc. 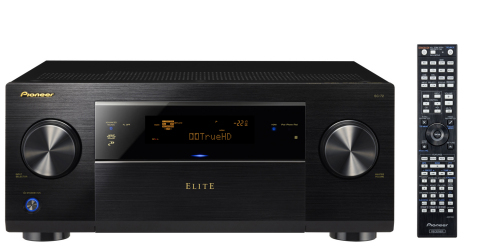 The Elite® SC-71 and SC-72 home theater AV receivers offer outstanding audio performance utilizing the power of Class D3 amplification and are designed to deliver studio quality audio/video output.